I’m not a huge fan of pancakes, but I have one exception – made from scratch blueberry pancakes. Not plain, not chocolate chip, not pumpkin, not any other flavor you can imagine. Blueberry. Only blueberry. 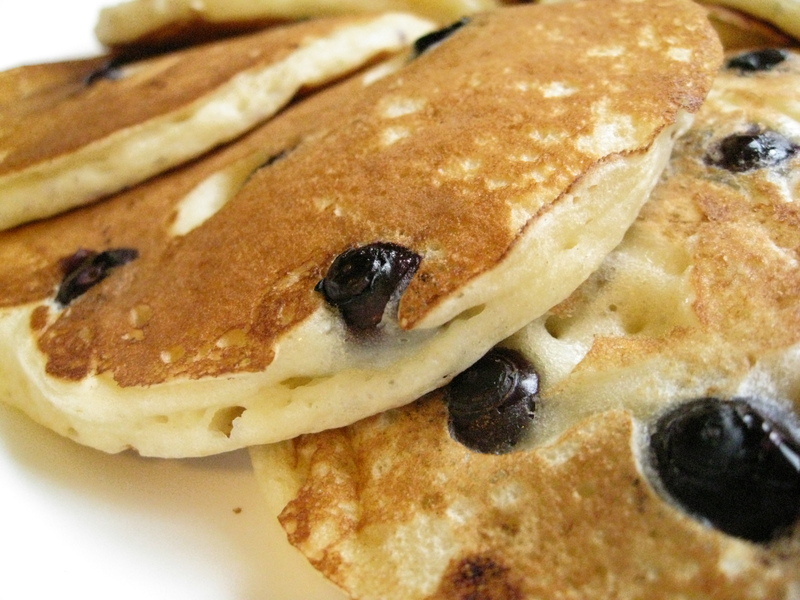 So, here you go – from scratch blueberry pancakes that couldn’t be easier to make. Trust me, I wouldn’t spend time making breakfast if it took a long time. I don’t have enough patience or energy in the morning to cook up anything complicated. Combine milk with vinegar in a large bowl and let sit for 5 minutes to “sour”. Meanwhile, whisk flour, sugar, baking powder, baking soda, and salt together in a large mixing bowl and set aside. Whisk egg and butter into soured milk. Pour the dry ingredients into the wet ingredients and whisk until lumps are just gone. Heat a large skillet over medium heat and coat with cooking spray. Pour 1/4 cupfuls of batter onto the skillet and immediately sprinkle some blueberries onto the pancake. I used about 4 – 7 per pancake. Cook until bubbles appear on the surface of the pancake. Flip with a spatula and cook until browned on the other side. Categories: Breakfast & Brunch, Quick & Easy | Tags: breakfast, fruit, quick and easy, vegetables | Permalink.